Back in 2010, Valentine's fell on a Sunday, which provided a excellent opportunity for my lovely wife Melanie to add to her tattoo collection. A lot of shops do special day promotions for the budget-minded, although the trend seems to be moving away from that. 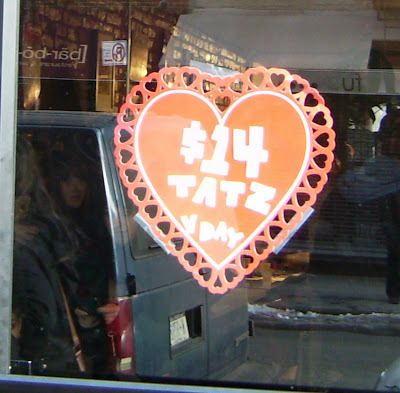 On this Valentine's Day, we here at Tattoosday are re-visiting that occasion three years ago. 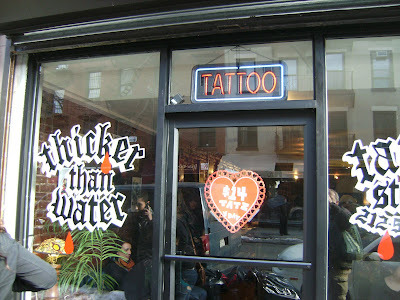 Please Note: Thicker Than Water, the shop involved, is NOT doing the promotion this year. I did find shops in San Diego (Nittis Tattoo locations) that are doing it this year, but I'm not aware of any NYC-based specials. So what does an inkblogger get his sweetheart on Valentine's Day? 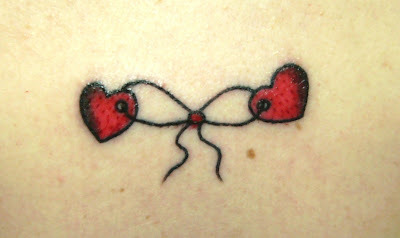 Why, a love-themed tattoo, of course. 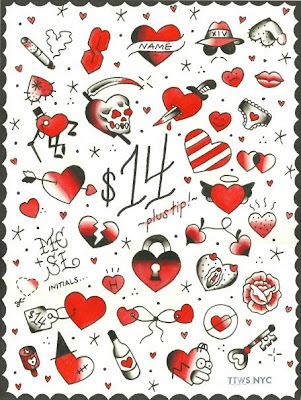 Lucky me, the good folks over at Thicker than Water Tattoo had a Cupid special, $14 tattoos on February 14. A lot like the Dare Devil Tattoo Friday the 13th Special (one of which is documented here), the lucky tattoo recipient can choose from an assortment of day-themed flash. When we got to the shop, Melanie signed in #53, and they were averaging a dozen or so per hour, so we knew we had a little bit of a wait. I specifically selected Shon Lindauer, since he did such an awesome job with my tiger tattoo. It was nice that Melanie got to meet Shon and the piece she selected was one that he had drawn up. When we left around 3:45, the waiting list was over a hundred, so they looked like they had a long night ahead of them. Thanks to Shon and the staff at Thicker Than Water for another great tattoo experience! If you're looking for Shon, he is currently settling down at his new shop, Queen Street Tattoo in Honolulu! This entry is ©2010, 2013 Tattoosday.